Fishing Report, March 31, 2013, Jeff Sundin - Happy Easter! Saturday's weather played into the hands of anxious anglers in the Northland and there were rewards for everyone who made it out. For some, the reward was fish, for others, new stories to tell. After following reports of open water on The Rainy River, my buddy Matt Mattson and his crew high-tailed it for Birchdale. When they arrived, the landing at Birchdale was already busy and they estimated 60 rigs parked along the road at 10:30 AM on Saturday. The landing is still ice covered, not open for larger boats; But these early crews all have boats that are small enough to push across the ice and into the river. At least that's what most of them thought. There was a truck and trailer stuck on the ramp at the time Matt's crew arrived, so before they could roll out, they volunteered to give them a tug, clearing the ramp for the next outfit. Conditions at the ramp will improve, but right now there are still 30 inches of ice and anglers at the landing speculated that without intervention by county equipment operators, the chances of finding an ice free ramp next weekend are doubtful. Judging by past experience, it's likely that the needed intervention will occur and we'll be keeping a close eye on the landing ramps and report as developments occur. Once the boys were finally on the water, fishing reports were mixed. According to Matt, there were some boats reporting catches of Walleye in the 80 fish range. Numbers for others, including Matt's crew weren't that high, but still, they did catch fish, including some nice size ones. River current is still slow and problems with runoff haven't cropped up. The cold front that arrived overnight is definitely going to slow down the melt and allow anglers an opportunity to get up there before flooding turns into an issue. Get your boat ready and keep an eye on the reports, conditions will change fast. Fishing Report, March 30, 2013, Jeff Sundin - Cub Reporter, Staff #0003 - Warm weather works it's magic and anglers are set to reap the harvest on Saturday. On The Rainy River It didn't take long after the first patch of open water showed up at the Birchdale Landing for anglers to begin making their way out to the water. On Friday, there was enough open water to fish and the early crew arrived to wet a line. The landing is still iced in, but there were a handful of fishermen who pushed small boats accross the ice and now, the game is on. There were fish caught yesterday and with the water now advancing downstream, I'm sure there will be lots of reports today. I have friends heading toward the river right now and with a little luck, I'll have some photos for tomorrow morning. Fishing Report, March 29, 2013, Jeff Sundin - Cub Reporter, Staff #0003 - There's something fishy about Easter weekend this year. Improving conditions are gonna give ice fishermen a second wind and one last chance to get out onto the ice. If beautiful weather has a way of lifting your spirits like it does mine, then Thursday was perfect. Warm, sunny and calm conditions encouraged surface snow to melt, providing a new, hard-packed platform for ice fishermen. The meltdown, combined with cold overnight temps, will make travel a lot easier for ice fishermen this weekend. 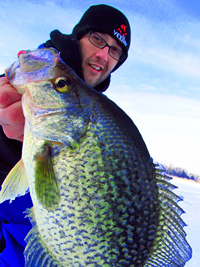 Crappies have been biting and we're getting reports from the few lucky anglers who are out catching them. This is a tight lipped crew and they're not gonna let too much information slip, but one thing I can tell you is that everyone who is actually out trying to find Crappies, are finding them. Any lack of fishing news is simply a matter of the extremely low numbers of fishermen on the ice. On Pokegama Lake, I found ideal conditions at the Kings Landing, where snowmobile traffic has been heavy and trails are packed hard. Even at high noon, under full sunshine, I was able to walk easily, without breaking through the surface. There hasn't been much fishing pressure out there since the Walleye and Pike season ended. So folks that want to cash in on late season Crappie, Sunfish and Perch action, have that option for this weekend. The Mississppi River was like visiting two completely different worlds. Downstream from Cohasset to the Pokegama Dam, the main channel was wide open. Anglers who had the notion to fish for Perch or panfish on the river, could access the river from at the Minnesota Power Company landing just West of Cohasset and fish on the river channel for a at least couple of miles in either direction. Further upstream, the Mississippi remains fully ice covered at the Highway 6 bridge. The backwater areas along Hwy 6 have almost no snow cover left, and numerous shiny spots of clear ice appear everywhere. The Rainy River continues to open more each day. Yesterday, the folks at Clementson Resort posted a pitcure of the River at Birchdale showing a patch of open water in the main channel. Tracks in the snow and a tiny Black dot on the water, reveal at least one pair of anxious anglers who pushed a small boat across the ice. That bit of news has Matt Mattson all fired up and he's planning on heading that way tomorrow morning. I'm guessing that they won't be alone and I'll bet that by Easter morning, fresh Walleye pictures from the Rainy will appear in this report. 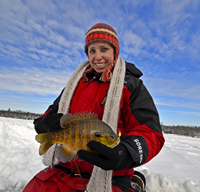 (3/29) Nik’s Tips From The Lake Winnie Region; "Water, water everywhere… Rainy River fishing isn’t far away as temps are reaching 40s this week and are predicted to go into next week. With this nice spring weather we are now finally starting to see the snow pack condense, creating spring run-off. Standing water on some lakes’ shorelines is also starting to appear. With a little luck we’ll have a strong south wind or winds with warm temps that will help disintegrate the snow and allow for the standing water on the ice to swirl back into the lake through small pressure cracks hopefully leaving a nice April window for spring ice fishing. Crappies and bluegills are still holding around steep slopes, drops and edges of weeds up to 10-12’ and in sliding of into holes of 30’. Try fishing an area where shallow water is close to these slopes and drops, leaving the opportunity to fish shallow, deep and in between without traveling too far. If your patient, the lake will be sure to tell you where the fish are holding as these schools will keep circling through. To get your bait down into the strike zone faster while deep-hole fishing, try Northland’s Tungsten Jigs, they drop like a marble, or a 1/16 Lindy Flyer, which flickers down while jigged. If the fish are finicky, downsize your presentation, tackle and bait. Adding a split shot weight 1’ above your tackle will allow you to fish smaller tackle in deep water. Keep a close eye on your electronics too, sometimes in deep water crappies will stay tight to the bottom without suspending; to get them to bite, keeping your bait tipped with wax worms or spikes 1-3’ of bottom will lip a nice paper mouth crappie. 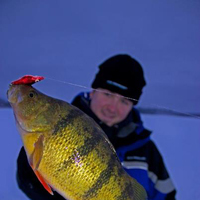 Perch will be moving into the spawning areas as the snowcap decreases. On shallower lakes and big water lakes like Winnie, perch will be in the gravel and rocky areas from 8’-14’ on underwater points leading to deeper water. Work areas with Northland Buckshot or Lindy Flyer’s, both offer a rattle spoon. Larger presentations will help attract aggressive perch and the weight of the spoon will allow you to keep your bait in the strike zone longer while covering more ground hole hopping. On deeper water lakes like Ball Club, perch will hold on break lines in the 20’ range. Look for turns and curves in the structure to hold forage for hungry perch. Mobility at the moment is still a draw back for covering ground effectively and for some is a nice excuse to forgo late season ice fishing and get the gear ready for the MN fishing opener. Others are prepping for the Rainy River, or, like me, are greatly anticipating a steelhead fishing trip next week. Snow machines are still doing the trick for most groups. The key is to lighten the load and hitch on the smallest sled you own to tout your gear out. If you can, balance your auger and gear on the snow machine. You’ll not only have a better chance of floating over the slush, you’ll spend more time fishing too. Remember to stay on the throttle to avoid getting bogged down in slush. A sure way on and off the lake is by foot. Look for small to mid-sized lakes and walk from their public accesses. Because of the amount of slush under the snow be sure to have a good set of rubber boots to stay dry. I’ve had good luck this winter and spring with a Minnesota based company…Muck Boots. 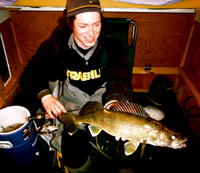 (3/28) On Rainy Lake; A quick reminder from Chris Granrud, RainyDaze Guide Service says; "The Walleye and Pike fishing season is still open on Rainy Lake. Travel in some areas has improved, but slush continues to cause trouble on the South and Northeast sides of the lake." - Chris Granrud, RainyDaze Guide Service . Fishing Report, March 28, 2013, Jeff Sundin - Cub Reporter, Staff #0003 - This is your lucky day! Conditions haven't really changed since yesterday and since I need to hit the road for a quick meeting this morning, you don't have too strain yourself to read the report today. A couple of quick notes, The ice on the Rainy River showed signs of weakening yesterday. But, it's really stretching it to assume that "big boats" could make it out there this weekend. I wouldn't be suprised to learn that anglers with "car-topper boats" might manage to push them accross the ice to find a little open water, but that assumes that there's gonna be a major breakthrough today and tomorrow. Snow on Deer River area lakes melted/settled fast yesterday. Stretches of the ice where slush was the worst, are now going to be the best areas for travel. At this rate, all we need is another day of melting followed by a cold snap and anglers can count on finding some fishing spots on the ice again. Stay tuned for a closer look tomorrow morning. Fishing Report, March 27, 2013, Jeff Sundin - Cub Reporter, Staff #0003 - The spring thaw might be a little late for some; For me though, today marks the first day of the official "I Hope This Doesn't Go Too Fast" countdown. I'm all for getting the chance to do some open water fishing, but I hope that the thaw doesn't get out of hand either. Temperatures in the high 30's might not sound warm, but with full sunshine and barely a breeze, the snow cover has already taken a gigantic hit. I noticed yesterday that the spot where I parked my portable fish shelter was surrounded by at least five feet of bare ground. The radiant heat was working overtime in that spot just like it is on the lakes and rivers. Ideally, we'd get another cold snap to help firm up the ice, slowing down the melt before we get too much runoff. Flowing water, at least too much of it would be the last thing that we need right now because flooding could ruin the fun for everyone, ice fishermen and river anglers alike. According to a second hand report, there was open water at Birchdale on the Rainy River yesterday. That almost gave me a panic attack, making me think that I'd need to get hustling to try and head up there this weekend. When I went on the internet to check it out, I saw that there is a patch of open water at the rapids, but not downstream by the landing. Even at the rate we're going now, it looks pretty optimistic that there will be an open landing this weekend. Maybe, but things would have to progress pretty fast. Above Pelland, there is a lot of open water and I think you could already get a small boat on the river there already. I dropped a line to a friend in International Falls and hopefully I'll have a river report from there for tomorrow morning. For those of you who'd rather do a little more ice fishing, I think you'll be in luck. The window might be small, but there's not much doubt now that the snow and slush will be manageable really soon. The forecast for next week calls for a slight cooling trend and not too much precipitation. (3/27) A release from the FLW Tour event on Lewis Smith Lake, Alabama, where Californian, Brent Ehrler took top honors in the form of a giant $125,000 check. “One of the spots I found with Down Imaging was an inside channel swing with three brush piles that I wouldn’t have won the tournament without. Although I never got a bite on it during practice, I saw lots of fish. So I ... >> Read Entire Brent Ehrler FLW Article . (3/27) On Rainy Lake; A quick note from Chris Granrud, RainyDaze Guide Service says; "Right now the Big Pike are starting to go up shallow and those monster Rainy Lake Crappie sare showing up outside of spawning bays. 2 days ago fishing Crappies we caught 50 with customers and 5 were over 14 inches with the biggest taping 16 inches on the nose!" - Chris Granrud, RainyDaze Guide Service . 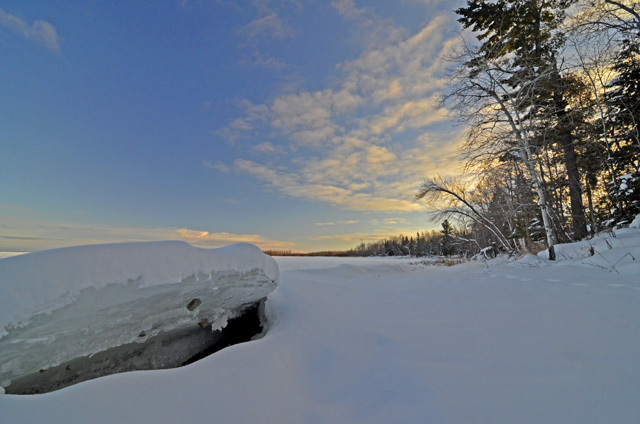 (3/27) Bemidji Lakes Area, Paul A. Nelson, Bemidji Area Lakes Guide Service says; "The Bemidji area still looks more like a winter wonderland than somewhere on the edge of impending spring. The daily high temperatures are finally inching their way above freezing, but the overnight temperatures are still cold enough to lock the lakes in an alternating pattern of melting and re-freezing. The deep snow and significant slush on the lakes is enough to discourage all but the hardiest of anglers. Snowmobiles are about the only method of travel on the lakes. Most of the roads and trails on the ice have been virtually abandoned after the last of the fish houses were removed from the lakes. The best bet for anglers is still Lake of the Woods. Most resorts are maintaining their roads on the ice, so anglers can access the lake and fish for walleyes, sauger and northern pike. 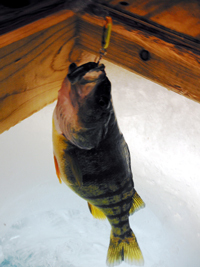 The perch bite has been sporadic on most of the other lakes in the Bemidji area. Many of the perch have been close to the drop-off along the shoreline or on the edges of shallow mid-lake flats and bars. Anglers are catching perch, but the largest age classes of fish are less than ten inches on most lakes, so anglers are struggling to find the larger jumbo perch. When the perch are active, anglers are using smaller jigging spoons tipped with a minnow head or smaller jigging minnows. When the perch are more reluctant to bite, then a smaller tungsten jig tipped with a wax worm or eurolarvae or a scented plastic may be more effective. The eelpout bite is virtually done, with the spawn complete on most lakes. Eelpout spawn in communal groups, so once the spawn starts, it usually goes pretty quick. Crappies in most lakes are still suspended along the shoreline break, close to the weed edges they will move into once the more of the snow begins to melt. 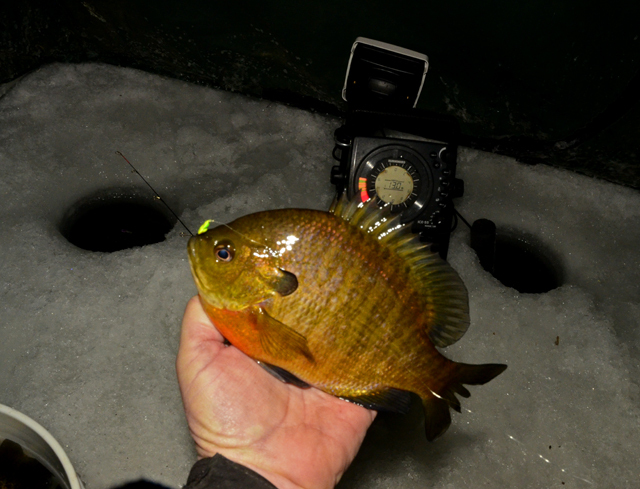 Anglers have also been catching some sunfish mixed in with the crappies." - Paul A. Nelson, Bemidji Area Lakes Guide Service, panelson@paulbunyan.net - 218.759.2235 . Fishing Report, March 26, 2013, Jeff Sundin - Cub Reporter, Staff #0003 - It didn't take long! Yesterday I mentioned that we'd be hearing about improvememnts in fishing conditions around the Itasca Area. It only took a day and according to early reports, we already are. Monday's weather played right into our hands as the mid-day temps pushed up to the high 30 degree range, bright sunshine took the edge off of the deep snow. Judging by what I saw in my own yard, the meltdown was significant and according to the forecast, we're on course for more of the same today. Along the way, I spotted lots of places where the snow cover and slush have already merged. That's really good, because a few days of this is enough to get back to good ice and great travel conditions. In fact, it might even mean that I can use the 4 Wheeler a couple of times to help justify putting the new skins on it last fall. (3/26) "In case you're tuned in to the gloom and doom reports about ice fishermen having nowhere to go and nothing to do. Bill Powell, Fred's Bait has been doing some field work and found out that the reports are about to get a whole lot better. Sunshine and warmer temperatures are working down the deep snow. Slowly but surely, ice conditions are getting better, fishing action is good and best of all, he's got the lakes all to himself. That is until you ... Click >> Read Bill's Fishing Report . (3/26) On the Rainy River, there are signs that the ice is weakening. So far, the open water hasn't advanced to Birchdale, but observations of dark ice at the shoreline and even a few tiny open spots in the main channel are encouraging. If present conditions persist, new patches of open water will be turning up daily. Anglers who really want to get out and fish open water, can do it, especially folks who live in the metro area. The Mississippi River south of the Twin Cities has been producing fish already and colder temperatures mean an extension of the "pre-spawn" period. For early spring Walleye fishing, water temperatures below the mid 40 degree range are when your chances for good action are the best. For today; There's a lot of catching up to do, but after 4 days of standing on a cement floor at the convention center, you can bet the farm that I'm going outside to have a look around. Who knows? Maybe I'll even suprise you with some good news tomorrow morning. (3/26) On the Lake of the Woods - The "evening bite" Walleye fishing action that we enjoyed a week ago held up throughout the past weekend. The action appears to be building as pre-spawn fish move toward current sources. Still not at it's peak, but improving. Northern Pike are beginning to show up in the mix too. So far, the majority of pike caught near the gap have been fish caught by anglers as they persued Walleyes. More devoted pike anglers will begin populating the area soon, especially as the snow cover is reduced. (3/26) On Lake of the Woods, Border View Lodge, Mike Kinsella wrote; "With the official passing of the first day of spring last Wednesday we feel like we are officially still having winter! The ice is in great shape to fish through the end of the month! We will keep our permanent houses out to ice fish through the 30th of March! It appears that we will be able to ice fish until April 14th which at this time we plan to do. With a great bite yesterday the fishing should only get better as the season nears its end. We have been getting a great number of Walleye and Sauger mixed and some nice 26 plus inch Walleye for bragging about! Special pricing for Walleye fishing in April. Take 20% off of our winter fishing packages to ice fish for Walleyes in April. Track vehicle transportation while fishing outside, no permanent houses. The guides will be able to take you to where the fish are biting!" - 1-800-776-3474 Border View Lodge . (3/26) On The Iron Range, From Greg Clusiau; "We found travel on Big Sandy to be excellent but once we stopped and started walking about, the snow was up to our knees. I was surprised the snowmobiles were able to ride on top of the snow as much as they did. I think the warm temps hardened the surface just enough to keep us afloat. Walking around was ... " >> Read Greg's Full Report . Fishing Report, March 25, 2013, Jeff Sundin - Cub Reporter, Staff #0003 - Back at home and catching up on fishing news from the Lake Winnie - Leech Lake Region. It cost me a Black and Blue right lower cheek to find out; But without even leaving my own yard, I've already discovered my first sign of optimism about the ice condition. While I was away, the snow has been melting, leaving a nice shiny sheet of ice everywhere. That means we're gonna get a short, but sweet window to make a few more ice trips before the lakes break up. I know that there's a lot of gloom and doom floating around out there about the ice and snow conditions. But over the past few days, I've noticed that more than a few anglers are finding places to fish. Fish pictures, especially Crappie pictures are turning up daily. Some anglers are either more stubborn than the rest, or else they're ahead of the curve, figuring out that there are still places to go. I'll bet that within a few days, fishermen are gonna figure out that slush problems are beginning to clear as the snow erodes under daytime sunshine. Looking at the forecast for this week, it appears that the weather could be almost perfect to produce just the right kind of a meltdown. Daytime temps that are just warm enough to melt some snow, overnight temps just cold enough to prevent a sudden flood on the lakes and at the landings. I know that a lot of you are chomping at the bit to get out and do something, but at this stage of the game, the last thing we need is a sudden return to "normal" spring weather. If it warms up too fast, we'll have more water than we know what to do with. Putting up with a little more cold weather would mean another week or two of good ice fishing and a better chance of getting in a good week of fishing up on the Rainy River. Fishing Report, March 24, 2013, Jeff Sundin - Minneapolis, Cub Reporter, Staff #0003 - The traffic was brisk at the Northwest Sportshow on Saturday. So busy that I I'm not too sure where most of went, except for the last few hours when the traffic calmed and we had a chance to recap the day. After 30 years of working at sport shows, I think that this was one of the most productive days that I've ever spent inside a booth. The whole idea of these shows is to connect with people and the Lindy team accomplished that with flying colors. Our focus this year has been helping folks catch more fish through education and we've got a great lineup of programming that makes the job easy. We spent our day turning anglers attention toward programs like Lindy's Fish ED or our network of How To Videos, Audio Fishing Reports and fishing articles. I think it was fun, it was a good day. Why don't you just swing by the booth today for a chat and see for yourself? The show opens today (Sunday) at 10:00 AM and runs until 5:00 PM and I'll be there all day. The Lindy Fishing Tackle Booth is in the fishing tackle section, booth #835. For today; It's been an odd morning around here, my wi-fi connection is really poor and I've had some trouble losing my work while I'm uploading. So if you don't mind, I'm gonna cut this report a little short, get myself ready for the show and then tomorrow, when I'm back at control central, I'll get the report ramped back up again. Oh, by the way, I talked with some friends who are here working the show for Lund Boats. They told me that boat sales have been strong throughout the season and that sales have been good here at the show too. With all of the snow out there, it might have slipped your mind, but there's only 48 days until the Minnesota Fishing Opener. In other words, if you're on the fence, you better get down here and make a deal so you're all rigged up and ready in time to get out there and catch some fish. Fishing Report, March 23, 2013, Jeff Sundin - Minneapolis, Cub Reporter, Staff #0003, - Nearing the end of a routine day spent chatting with visitors at the Northwest Sportshow, it was good time to see what news I could drum up for Saturday. I headed for the Humminbird display to visit with a fishing buddy and get some ideas about setting up the I-Link system. It's a setup that combines Humminbird, Lakemaster and MinnKota technologies to allow anglers a direct link between their Lakemaster charts and the MinnKota's I-Pilot. You can tell the trolling motor to follow a specific depth contour and let the system go to work. For someone who's got a lot going on inside the boat, or just wants to free up their hands to do better things, this system is a real time saver. Our conversation led to stories about his recent fishing trips on the Mississippi River. For him, the Walleye action on Pool 4 has been already been good for a couple of weeks. He's been fishing with swim baits like Yum's Money Minnow on the downstream edges of wing dams. His presentaion is casting the bait and slowly retrieving it back to the boat through the slack current behind the wing dams. That reminded me that in just two weeks, I'll get my turn to do some river fishing too. With open water already working it's way toward Birchdale, my first scheduled trip to the Rainy River might get moved up, especially if the weather breaks late next week. Stay tuned for more about that. While we're on the subject of Walleye fishing; I wish that you'd come down to the show and check out Jon Thelen's free seminars about Weeds and Walleye Fishing . In case you haven't treated yourself to Lindy's Fish ED Internet TV shows, or seen him on Midwest Outdoors, Jon has a way of firing you up and making you want to jump in the boat and go! Some guys are just plain better at this sort of thing than others and when it comes to teaching folks about Walleye fishing, Jon's way of doing it is really good! Jon's seminars are scheduled for 5:00 PM and 7:00 PM and they are well worth coming to see. Oh and by the way, since a good turnout would help keep him in a good mood and because he's my boss ... well you get the idea, I'd kind of "owe you one" just for helping out. When I was heading back toward the booth, I stumbled into an old friend. Someone who's philosophy about fishing and the fishing industry has influenced me more than anyone. Gary Loomis is in town and he's at the show! Though they may not know it, there aren't many fishermen that haven't been touched by Gary in one way or another. In fact, at one time, every single graphite rod no matter what the brand name, that was produced on american soil, came from Gary's factory using technologies that he developed. When it comes to producing a graphite rods, Gary is the foremost authority and most fishing rod "experts" either learned what they know from him or from someone else who learned it from him. As a budding young fishing guide in the mid 80's, I was one lucky fella when I earned a Pro Staff position with his company. I can honestly say that I have never met another person in this industry that set higher standards, demonstrated more integrity or pursued perfection more eaglery than Gary. His influence helped build a lineup of historic fishing rods. His influence helped me strive to be a better fisherman, a better guide a better person. Even after he sold his company to those other guys, I stuck with 'em for a long time. That is until I found out that Gary was back. You already know that TFO Rods and Gary have teamed up to build another line of fishing rods. And you already know that I LIKE 'EM and that just like you, I stand in the checkout line to buy 'em. No freebies, no sponshorships, nothing like that at all. What you may not know; Is that if you fish, if you fish with a graphite rod, then Gary Loomis has touched your life already. Now today, Gary is gonna be at the show again and for what it's worth, if you're smart, you'll come down here and shake his hand, hoping that some little spark of his talent rubs off. That's what I did! (3/23) Nik’s Tips From The Lake Winnie Region; "Plain and simple, mobility and slush on big and mid-sized lakes are still causing transportation to be tough, if not impossible in many areas. Most lakes are holding anywhere from 6-12” of slush with 2’ of snow on top. The good news is there is still plenty of solid ice. Snowmobiles are continuing to get the job done getting around most areas, however, be sure and stay on the throttle if you start to get bogged down in slush. Better yet, look for packed trails on which to travel. Travel light. 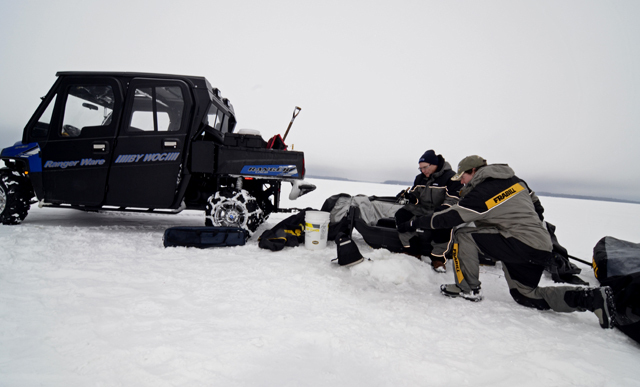 If you’re able to carry your auger, bait, tackle and rods, without hitching your portable house on your sled, do so. It will be much easier for you to stay on top of the snow and slush. Pulling any type of portable house or sled will bury you into the slush and bog your snowmobile down. Getting the sled out isn’t too bad, but a portable house in the slush is like moving a ton of bricks. By leaving your portable fish house at home this week you’ll spend less time shoveling your gear out and more time fishing! The best access to fishing spots is close to the lake’s public access. Staying within walking distance is a sure way on and off the lake. Smaller lakes offer this type of fishing for bluegills, crappies and perch. Perch fishing with live bait and larger tackle that rattles while jigging aggressively will attract active perch. If the perch are finicky, downsize your tackle and slow your jigging technique. Look for shoreline structure in 8-12’ with rocks, gravel, and under water points leading to deeper water and shoreline flats in 14-17’. If you’re able to travel by snowmobile, the main lake flats will hold schools of perch. Crappies and bluegills will hold on structure differently on each lake. Last weekend we found crappies off a steep slope in a 30’ hole. Yet on another day the crappies were holding in 20’ between two main lake basins. Drill a line of holes lead shallow water to a deeper hole or off a steep slope. Smaller Northland and Lindy tackle tipped with wax worms and spikes have been doing the trick. Remember, once you’ve found crappies stay put and let the schools swim back through. Using a spring tip on your rod will definitely increase your bite to hook up ratio and put more fish on the ice. - Good luck fishing and I hope to see you on the ice or hopefully a river soon!" Fishing Report, March 21, 2013, Jeff Sundin - Satff Reporter #3 checking in from downtown Minneapolis on the floor of the Northwest Sportshow. From the minute I stepped into the Minneapolis Convention Center on Thursday, I had the feeling that the sportshow was gonna be a little different this year. It was a little hard to put my finger on it, but something told me that this year's features were gonna be less "Pizazz" and more "Meat and Taters". On my first walk around the show floor, I saw evidence of just what I was expecting; What I saw was a lot less focus than usual on the "new and improved" gadgetry. Instead, vendors are showing off products that offer a lot of value, you know, more "bang for your fishing buck". In fact, I stumbled into one smokin' hot deal that's so good, I'm tempted to keep it a secret, but just to show that I'm a good guy, I'll let you in on it, if you're paying attention. For some reason, I always get drawn to the fishing rods, I just like 'em. This time, the first ones that caught my eye today were a pair of new Walleye rods by Diawa. Their DXW721MXS and the DXWMXLXS are both seven footers with a well thought out handle design, there's just enough real cork in just the right spot to satisfy us guys who like the feel of cork. The rods feature Fuji Guides, IM7 Graphite and a 5 year warranty, all for about $90. I caught Matt Careful showing off Thill's new Wobble Bobbers. Just right for bank fishermen or anybody who wants to get great distance out every cast; The weighted Balsa Wood floats feature Brass grommets at both ends that prevent line grooves and ensure smooth flow as your line slips through the float. What's so special about these though, is the unique design that makes the bobber "wobble" on the surface. Even with just a hint of breeze the bobber stays in constant motion. The extra action keeps your bait looking alive and healthy, giving the fish an extra reason to look your way. On the way back to home base, I stopped by the Reeds Sporting Goods booth to see if the boys had anything special going on. As usual, they were busy demonstrating electronics and while I waited for a chance to get a quick word with Drew, I happened to look over my shoulder and spot a sign that said "Buy 1, Get 1 Free", one what? You might recall a report from last year at this same show, remember? The one about the TFO Fishing Rods? "For all of you Gary Loomis fans out there, here's something you'll really like. Temple Fork Outfitters, AKA TFO Rods is building a great line of affordable rods that are designed by Gary from the ground up. He chooses the materials, the guides, the finish, everything right down to the line for wrapping the line guides. Here at the show, anglers are watching a few models. The TFG FWS 662-1 and the GTS DSS 693-1. The TFG FWS 702-1 and the GTS CB 704-1". Well, since last year I've picked up seven of 'em and they've worked out great for me. Friends and relatives accounted for another dozen and so far, I've heard nothing but good about them and Guess What? Right now, Reeds has a rack full of TFO Rods priced at $99.00 with a special offer "Buy One, Get One Free". Just to be sure, I asked if they had plenty of 'em and right now they do, but I have to warn you, at 11:00 AM today, I'm gonna pick up my next four rods and i'm guessing that they'll be flying out fast, so if you want a couple, don't wait too long you get down here. Fishing Report, March 20, 2013, Jeff Sundin - Welcome to Spring! I Know, it's not really looking too springlike, but prepare yourself, soon we'll have more water than we know what to do with. It feels like I've been coming up a little short on fishing reports lately. But it's just one of those lulls in the season that comes along occasionally. Don't worry, starting tomorrow, fishing news will start flowing again, even if it is coming from the floor of the Northwest Sport Show. By the time I get back, we just might be in the middle of a spring melt and pick up a few bonus days of ice fishing. For today, I'm gonna celebrate my first day of spring by taking a little drive over to pick up my new boat! By mid afternoon, she'll be in line, waiting to get fixed up with all of the do-dads and gizmos that are gonna help lead us to the fish this spring. Which, by the way is coming a lot faster than you think! Did I already mention that? Fishing Report, March 19, 2013, Jeff Sundin - While you're waiting, why not gather up your gear and get ready? Even now, with snow piled everywhere and three feet of ice on Northern Minnesota's lakes, the clock is ticking. All of that White stuff is just practice, a blank palette in preparation for the scenes of spring. In fact, my first scheduled open water trip on the Rainy River is only 17 days from now. That doesn't leave much time, especially when I still need to pick up the boat, get the outboard installed and rig up all of the electronics. What about you? All set and raring to go? (3/19) Redefines Ice Fishing - What would you call it if the same angling team won the National Championship, plus another 1st place finish and two 2nds in qualifying events—and the Team of the Year title—all in the same season? Historic? Dominating? Certainly, you’d call it a pretty sweet showing. That’s exactly what occurred during the 2012-2013 icer season when ... >> Read Full Report . (3/19) ... and SOME GOOD NEWS! Fishing On The Rainy River is drawing near. A report from Clementson Resort on March 15th says; "Manitou is now wide open. We also gained a mile of open water to the west. There are now only 6 more miles to Birchdale. The latest weather system has missed us so far and hopefully it stays south of us." An update yesterday reported that while there is no open water visible at the Fanz Jevne wayside rest, the shoreline has become wet. Water always wins and now that it's getting saturated, the next open stretch is just around the corner, literally! Fishing Report, March 18, 2013, Jeff Sundin - Another snowy day, but there can't be too many more coming, right? Even now, as I write the report, there's another winter storm blowing through the branches outside of my window. At the moment, it doesn't look like we've had a lot of new snow, just enough to ensure a cleanup session in the plow truck. There is a lot of wind blowing though and that's gonna be a mixed blessing out on the lakes. I know, It would be great to wake up in the morning and have a gigantic list of good fishing stories to chat about. At the moment though, I'm afraid that everyone is on the same bandwagon; Slushy, sloppy conditions are the rule, not the exception and unless you have a secret gem tucked away, you're probably counting the days until the meltdown. The best news is that soon, spring will take hold and fix all of this for us. We don't need to do anything except remember, it's just a matter of time! One glimmer of hope comes along with these windy conditions; Ice conditions on lakes with large, open stretches, exposed to high wind will likely improve. As the loose surface snow gets blown free, moisture has easier access to the colder surface temperatures and that will help freeze up a little bit of the water. Smaller lakes, or areas where the blowing snow settles into drifts are probably gonna get worse because deep snow will insulate even more, trapping the water and slush beneath the surface. The rule of thumb will be to seek areas that have been blown clear and avoid drifted areas. (3/18) Even while you sleep, they prowl. Underwater worlds surge and pulse with nervous predatory energy. View Video >> Aqua View's "Mini Reveals Underwater Antics . (3/18) From The Iron Range, From Greg Clusiau; For anglers seeking Walleyes, Lake of the Woods has been about the only game in town. Here's one report that came in on Suinday; "Fishing the past few days has been fairly good, with some getting limits and others reporting some nice slot fish with plenty of eaters. With the pending snow storm this evening and tomorrow, we will be pulling our houses back over the heave today and only be running them near Pine Island for the rest of the season. It's that time of year and the fish are thinking about spawning and moving towards shallow water already. We will " ... >> Read Greg's Full Report . (3/18) Highbanks Resort on Lake Winnibigoshish wrapped up their season yesterday; "Our access is closed to all vehicle traffic due to tremendous amounts of slush. Thank you for a great winter 2013 season! We look forward to seeing you during open water season. (3/18) On Lake of the Woods, Border View Lodge, Mike Kinsella wrote; "Cooler weather continues to dominate the forecast. With plenty of snow and over 3 feet of solid ice, we have an excellent chance of fishing through the end of the month! While the bite remains challenging on the south end, schools of active fish have moved in near the reefs. Good numbers of fish are being caught with plenty of big walleyes. Small presentation has still been the most successful. Gold and glow reds have been the colors of choice. Mix your jigging techniques as the level of aggressiveness in the fish varies throughout the day. Don’t forget we are able to have our houses out until March 31st and Walleye is open until April 14th. 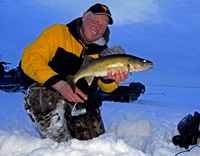 Come on up for one more chance at winter walleyes!" Border View Lodge . Fishing Report, March 17, 2013, Jeff Sundin - Happy St. Patricks Day! I know, I don't have enough Irish blood in me to qualify as a Bailey's tester. But any country who has a national monument based on good luck, well how can ya' not love that? By the way, there are over 36 million people of Irish ancestry living in the US these days and today, all of them have an excuse to stay inside and drink. That's lucky, because our ice conditions continue to get worse so they probably can't go ice fishing anyway. I took a drive up to Lake Winnibigoshish on Saturday and the scene was kind of spooky. During mid March, I should have seen hundreds of Perch fishermen on the lake, clustrered around all of the popular weed flats and shoreline breaks. Instead, I saw a half dozen portable shelters scattered around Tamarack Bay. A single trail leading out from the Bowens road onto Cutfoot Sioux revealed water filled tracks. Deep slush, the kind that makes any contrivance with tracks, skis or wheels equally impossible to use, has this lake and many others just about completely shut down while we wait for a spring meltdown. Looking through photos from this time last year, I was reminded of the contrast between the two seasons. On this date last year, we were fishing on clear, black ice. The snow was gone, the streams and narrow spots were flowing water and the area was filled with Swans, Geese and early arriving Ducks. Today, snow drifts have barely begun to settle, let alone melt. There were dozens of snowmobiles out on the trails yesterday and except for the Mississippi River, there's no trace of open water anywhere. At this late point in the season, odds are that I'll do my next fishing trip in a boat instead of on the ice. In fact, open water on the Rainy River is slowly but surely advancing downstream. By the time we wrap up the Northwest Sportshow in Minneapolis next weekend, the Rainy River could very well be all set for an early visit. It's going to be an interesting spring up there, because the speed at which the snow melts is going to completely determine the fate of Walleye anglers heading toward the popular spring fishery. If the melt is slow and steady, we'll get a nice window of time to work with. But if warm weather strikes suddenly, conditions are gonna get really wet up there and flooding could cause an early end to the pre-spawn Walleye fishing. Fishing Report, March 16, 2013, Jeff Sundin - Northern Minnesota Ice Conditions. Could this be the end? Right now, it seems a lot easier to give you Snow Reports, than fishing reports. We got hit with another couple of inches on Friday and there's a chance that we have another significant storm bearing down on us, due to arrive early Monday. Without a snowmobile or another reliable track machine, access is already very limitied. North Central Minnesota lakes are at the saturation point with water and slush already and the few rental operators who are still managing to maintain plowed roads, may be forced to throw in the towel if another heavy snow does arrive. Many of them already have. (3/16) Nodak Lodge on Lake Winnibigoshish had this report; "Off road travel is no longer an option. hard to get roads very wide & dry, do not plan on pulling trailers on lake, snowmoblies recommended. & auger extensions, 30-36in snow depth. LAKE ACCESS IS OPEN TO OUR CABIN RENTALS ONLY, It is CLOSED TO DAILY TRAFFIC FOR THE REST OF THE SEASON. Angling house rental is done for the season, Walleye & Northern season is now closed. Fishing is good, but lots of work. Slush under the snow, wear good BOOTS. lots of 9-11in perch even though you have to sort alittle. Perch are bitting in 12-16ft. morning hours are best on a sunny day. Cloudy days are good on & off through the day. Areas have been snag, and Hunters, to river bar. All jigs colors, but mostly gold, green chart. As of Monday 18th, they are talking major snow storm, If so we will no longer will be able to plow, because depth of snow and flooding. snowmoblies only and you still have to watch yourself with those, because of slushy areas. (3/16) At this point, Leech Lake area reports are not reliable, but knowing that conditions over there were already poor, I doubt that there's much more good news, especailly on the lakes East side. (3/16) Ice Fishing Shelters Deadlines. Just in case it slipped your mind, permanent ice shelters in Northern Minnesota need to be off the lakes by March 18th. Dates of removal are determined by an east west line formed by U.S. Hwy. 10, east along Hwy. 34 to Minnesota Hwy. 200, east along Hwy. 200 to U.S. Hwy. 2, and east along Hwy. 2 to the Minnesota-Wisconsin border. Shelters South of the line already came off the lakes on March 4th, the rest come off after this weekend except for those in the far North. Anglers on Lake of the Woods have until the 31st to remove their shelters, unless the ice goes bad sooner than that. (3/16) On Bowstring Lake, A report from Erin at Geiger's Trails End Resort says; "Most times I would love to say, without hesitation, the conditions are great, but I would not be truthful. This last weekend has been very challenging with the fish bite AND the lake conditions. I will give you the information so you may make you own mind up. Lake has 3 feet of ice with 8 to 12 inches of slush on top of it with about 2 ½ to 3 feet of snow on top of that. We do have roads, but we are in the process of making a decision, today, as to weather we should be closing them. They all have 6 to 8 inches of slush on them. I will know more after we assess the conditions today. We did have a cold night last night. So, hopefully that helped to freeze some of the stuff on the roads. However, travel with snowmobiles would be the way to go, but the risk is high that one might get stuck if you stop anywhere. We do have cabins available if you are still interested. Let us know what you’re thinking." Erin and Bill Charlton, Trails End Resort . 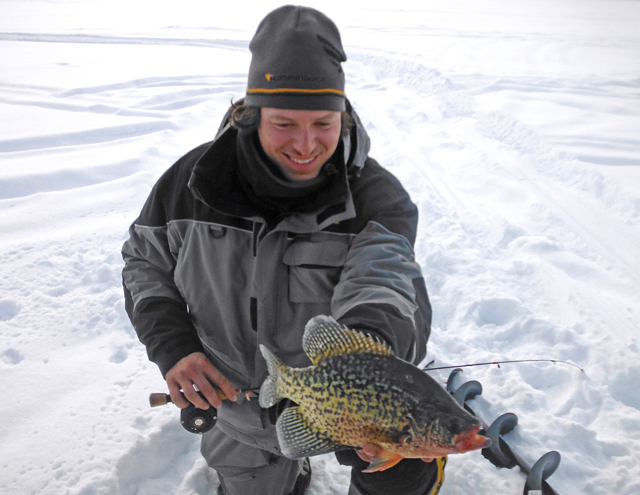 (3/16) From the Lake Winnie Region, Nik Dimich says; "Crappies are going to take some more patience because the schools roam in and out of the main lake basins in around 20’ of water and then will suspend in the 30’ holes. Again, I like to drill holes at all different depths around sharp break lines and search for suspended fish. My Humminbird Ice 55 not only makes locating suspended crappies a breeze, with the oversized flasher and digital depth indicator, I rarely miss the quick structure transitions. If you are looking for bluegills, they will also be mixed in these areas and in shallow weeds in the 10-14’ range. You might have to ... Read >> Nik's Tips Lake Winnie Region Fishing Report . 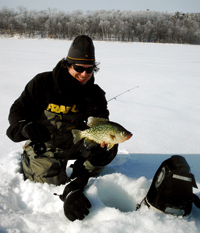 Fishing Report, March 15, 2013, Jeff Sundin - Northern Minnesota Ice Conditions are in transition. I arrived home on Thursday to news that there are lots of temporary ice access closures because of the heavy slush. The underlying ice is still good, reports of solid ice ranging anywhere from 28 to 36 inches. It's the over abundance of water and slush on top of the ice thsat has forced some of the resorts to shut down accesses to vehicle traffic. The move is not just to protect anglers from getting stranded out on the lakes, but also to prevent the roads from deteriorating too fast. That's inconvenient for now, but it's the smart way to manage the conditions and it just might save the roads long enough for anglers to get an extra week of fishing after the meltdown. As I get caught back up today, I'll pin down details from more resort owners about their specific roads. But I can start you off right now with a good news/bad news scenario; The bad news is contained below in the report from Trails End Resort on Bowstring Lake. The good news is contained in the report from my trip to Lake of the Woods this week, where we found ice and snow conditions to be very good, especially when compared to conditions we'd found closer to home. (3/15) From Lake of the Woods, I teased you with part of the report yesterday, so let's start there and then pick up where I left off. (3/15) Bemidji Lakes Area, Paul A. Nelson, Bemidji Area Lakes Guide Service says; "The fishing reports are starting to sound like a broken record. Lakes in the Bemidji area are covered with snow, flooded with water and mired in slush. Anglers that still have a fish house on the lakes in northern Minnesota (except on border lakes) have until March 18th to get their houses off the lakes. Anglers are allowed to use portable or wheeled fish houses after the 18th, but they must be removed from the lakes each day or when not occupied by anglers. 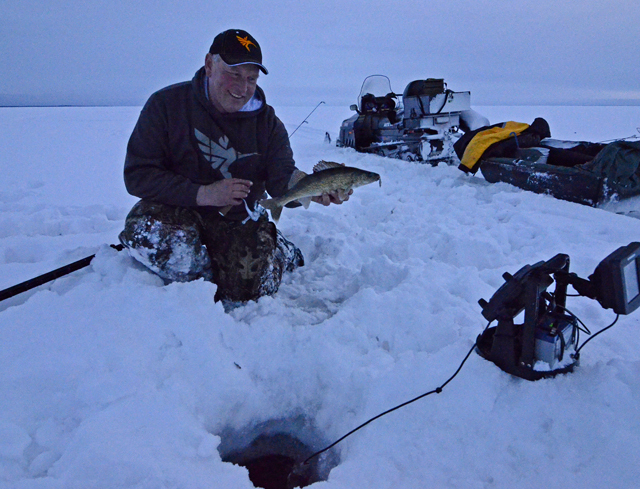 Eelpout are beginning to spawn under the ice, with anglers finding the fish very active, especially after dark. Eelpout spawn in communal groups on top of bars and humps with direct access to deep water. Anglers have also been finding perch in multiple locations. 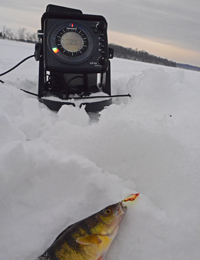 Most perch have been moving towards shallow water, but the progress has been slowed by the late spring. Most of the perch are on the edges of the shallow flats, with fish moving up and down the breakline to feed. Perch have been biting on smaller jigging spoons or down-sized jigs tipped with eurolarvae or wax worms. Anglers are finding crappies and sunfish suspended over deeper water, close to structures they will move into once more of the snow melts. Anglers should use their electronics to figure out what depth to set their baits. Lake of the Woods continues to have a good bite for walleyes, sauger and northern pike. 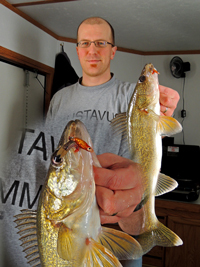 Anglers are finding sauger in deeper water near the bottom. Walleyes have been suspended over deeper water during the day and close to structure in the mornings and evenings. (3/15) Nik’s Tips From The Lake Winnie Region; "Ice conditions will be changing day to day as more slush shows up on top of the ice sheet and close to edges of lakes. This will also vary from lake to lake as lake accesses will vary according to their ice sheets. If you are traveling off plowed roads, snowmobiles are the best (and maybe only) bet for mobility. When traveling by snowmobile on lakes look out for low spots and discolored areas as well as any heavily fished areas because the past few weeks more slush has appeared. When traveling with friends on snowmobiles keep a safe distance away so you won’t end up in the same slush hole as your buddy. As always, the safest way on and off the ice is through area resorts, so be sure to call ahead for access updates and check in with bait shops and sporting goods stores for current conditions. 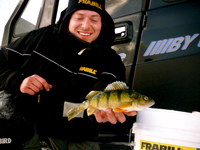 If you are fishing for perch, remember, mobility is still the most important factor. Don’t fish “where they ain’t.” If you do, however, locate an active school of perch say, on structure in shallow from 10-12’, stay for a while after they have quit biting, they might come back. Look for rocks and points leading to deeper water to hold fish and then drill lines of holes to work varying depths. The same goes for fishing flats off the shoreline and mid-lake structure in 15-17’. Winnie’s Center Bar is a good example. Fish several holes, looking for active fish. If they don’t bite on smaller presentations, go larger with presentations like Lindy’s Rattl’N Flyer or Northland’s Forge Minnow or bigger spoons. Tip them with a piece of minnow, a head or full minnow. This will not only attract active fish, but will help you find them faster. Crappies are going to take some more patience because the schools roam in and out of the main lake basins in around 20’ of water and then will suspend in the 30’ holes. Again, I like to drill holes at all different depths around sharp break lines and search for suspended fish. My Humminbird Ice 55 not only makes locating suspended crappies a breeze, with the oversized flasher and digital depth indicator, I rarely miss the quick structure transitions. 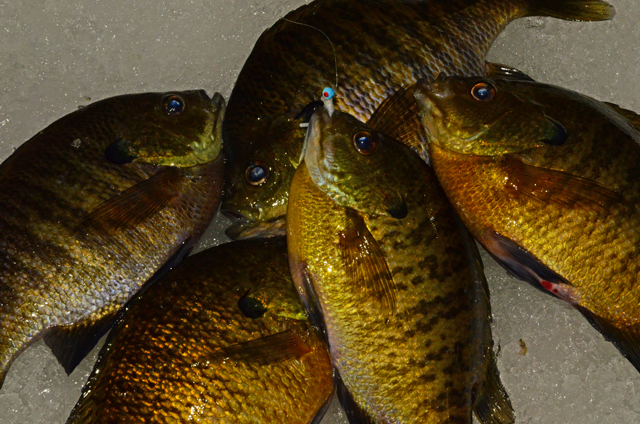 If you are looking for bluegills, they will also be mixed in these areas and in shallow weeds in the 10-14’ range. You might have to, however, decrease your jig presentation weight and tip it with waxies. When fishing for crappies or bluegills also downsize your line to a 1# or 2# monofilament and use small bug like tackle from Northland or Lindy. Be sure and fish two rods if the opportunity presents itself and have minnows and wax worms in your lineup to use with different tackle/bait presentations on each rod. Good luck and I hope to see you on the ice!". Fishing Report, March 14, 2013, Jeff Sundin - An extra dosage of good luck came our way on Wednesday afternoon. All of the scouting and planning took hold and the fish made their move at the right time and place for us. It's tempting to make it sound like we did all of the heavy lifting, but really, when you're lucky, you just have to say it. working really hard at it encouraged the luck, but on a lake the size of Lake of the Woods, a big part of the strategy includes making a lot of moves, asking a lot of questions and finally, fine tuning the knowledge you gain along the way. There's gonna be a lot more said about this fishing trip later, but the secret to having a great afternoon was "dialing in" to pinpoint the spot. Now it would be equally tempting to say that I knew how it all fell into place, but on this lake, I'm more like a tourist than a pro. Luckily, I know enough about fishing to understand what I learned as I watched the real expert figure out how the pieces fit together. You'll hear a lot of folks talk about lakes that are like "big bowls" structureless and hard to figure out. That's how you could describe Lake of the Woods, until you take a closer look. There is structure, lots of it, but picking out a hard spot in the mud or a one foot depth change just doesn't figure into most peoples game plans. I'll be on the road today, making my way back to better setup for writing, so bear with me and I'll get to the point, tomorrow morning. (3/14) "An extra dosage of good luck came our way on Wednesday afternoon. All of the scouting and planning took hold and happily, the fish made their move at the right time and place for us. It's tempting to make it sound like we did all of the heavy lifting, but really, when you're lucky, you just have to say it. I'll add that working really hard at finding the fish helped to encourage the good luck; But still, on a lake the size of Lake of the Woods, part of the strategy includes making lots of moves, asking lots of questions and finally, combining and fine tuning the knowledge you gain along the way. There's no doubt that the secret to having a great afternoon was "dialing in" all of the information to pinpoint the right spot at the right time. There's gonna be a lot more said about this fishing trip later, but what I can share right now, is the process that led us to the final outcome. On Lake of the Woods, I'm more of a tourist than I am a pro. Sure, I've been there, but most times, I've done what lots of anglers do. Get a rental house and hope that the operator has it sitting in the right spot. Sometimes they do, sometimes they don't. This time, I got to be part of a group who was on a mission to find "the bite". No easy task on the giant lake, especially when it's clearly not in it's peak form. Usually, you'll learn more during the tough times than you do when the fishing is great and from that point of view, this was a fantastic learning experience. Luckily, I know enough about fishing to understand what I learned; As I watched and expert figure out how the pieces fit together, I did my best to soak up as much knowldege as I could. You'll hear folks talk about lakes that are shaped like "big bowls", structureless and hard to figure out, with fish that roam. That's how you could describe Lake of the Woods, but when you take a closer look at those flats, there is structure, lots of it. Picking out a hard spot in the mud or a one foot depth change doesn't figure into most peoples game plans, but that's one of the secrets." After searching high and low, looking for the fish in all of the places where they are supposed to be. Questions started getting thrown around. If they're not here then could they be shallower? Deeper? You know the drill, there was a lot of head scratching going on that lead to a series of moves. At this point, trial and error was still driving the game plan, but eventually there was a clue. A visit to shallower water on Monday evening gave us something to work with. The fish, mostly small ones, made an evening run into the shallows at about 6:00 PM. We didn't catch a lot of fish, but there were enough to give our fearless leader the idea to try and pin 'em down. On Tuesday, we spent another day searching for fish in all of the "usual spots", but this time, the game plan included going back into the shallower water, this time earlier and with the intention of fine tuning the location. We were in the same general area, but with five anglers set up, we had the ability to cover enough water to try and figure out where the fish were coming from. This time, when the feeding run started, Jon could compare who caught what and where. The plan started coming together, all of us had a little action; But there was only one sweet spot, a subtle depth change of only one foot, but nevertheless it was a higher point and this was where the fish concentrated to feed. Another shelter set up on the same breakline but on an inside curve missed out on the run and the rest of us on the flat had far less action than he did on the point. On Wednesday, the whole game plan was a lot more relaxed. We skipped the lakewide search for daytime biters and concentrated our effort on being set up on the point, this time in perfect position for the evening run. We already had a starting spot, the point that Jon had fished the evening before. Now that he had an idea about which way the fish would be moving in, we'd get all of the shelters set on that same point. If we covered the entire structure, then theoretically, we'd all have good action. When we got out onto the lake, we had a couple of hours to burn before the evening run would begin. But we needed the extra time to get into correct posotion. Plus, we needed some extra holes drilled along the structure just to provide alternatives if plan A didn't work out. I watched Jon drive his snowmobile in circles while he watched his GPS. Finally he stopped and said drill here, right here. I said, okay if you've got that point pinned down that close and this works, then you're gonna get a Big Atta Boy! I drilled the holes where he told me to, and from that point on, all we had to do was prepare for the action. At 5:30, I saw the first signs of the feeding run beginning when I caught a couple of small Walleyes. Around 6:00 PM, it got a little more serious, first a 14 incher, then a 17 incher and soon the action was as good as it gets, just like clockwork. The fish moved onto that point, a subtle rise from 16 feet up to 15 feet, hardly noticable to most anglers, but the fish loved it. Presentation was simple; 1/16 ounce Rattlin' Flyer Spoons tipped with minnow heads were all we needed. The fish needed a little teasing, but they were clearly coming onto the point to feed, so getting them to strike wasn't hard. Drop the spoon, jig it until you spot a fish, raise it a foot or so and if the fish follows, jiggle the rod tip until it strikes. In the end, it seemed easy, but the easy fishing was the result of a three day process that involved covering lots of ground and involved lots of head scratching. The most valuable lesson I learned was to pay attention to every tidbit of information and use the clues to keep fine tuning until you hit paydirt. Oh, By The Way Jon, ATTA BOY! Fishing Report, March 13, 2013, Jeff Sundin - A lot of people credit patience as the virtue that makes fishermen successful. But really, I think it's pesistence that seperates the really lucky anglers from the moaners and groaners. Like I said yesterday, Lake of the Woods has been far from "on fire"; But there are groups out here that find fish and every day, someone has a good story to tell. Now, if you take five head strong fishermen, throw 'em all together and tell 'em that they can't go home until they find some fish, then the odds of getting a good story get a lot better! We've been searching high and low for the "Hot March Bite" that Lake of the Woods is famous for and if it's happening, we still haven't found it. But, luckily we did find a little action on Tuesday afternoon as the fish made an hour long feeding run just before dark. Walleye and Sauger on Lake of the Woods are usually daytime feeders, but most successful anglers are reporting better results fishing in the early morning and late evening right now. The combination of deep snow and thick ice might be what's causing it, maybe there are other environmental causes too, but the fish are apparently shallower than usual right now. At dinner last night, reports of good action in 10 to 12 feet of water added fuel to the fire, because that's one of the things that we had speculated during the afternoon. Our best action was a little deeper than that, but if we'd gone shallower, who knows? I f we'd gone into the shallows instead of looking in the deep haunts where they're "supposed to be", we may have found fish more quickly, but even now, we don't know that for sure, it's just another theory to test today. Our best presentation was a 3/16 Red/Glow Rattlin' Flyer tipped with a minnow head. For me, a #2 Frostee tipped with a tail hooked minnow and "dead sticked" was a good combination too. By the way, I mentioned deep snow, but travel conditions up here are much better than we've found elsewhere in the Northland. The snow is wind blown and hard packed, with very little slush to contend with. Once it warms up, there will be some water problems, but so far, it's pretty easy going. 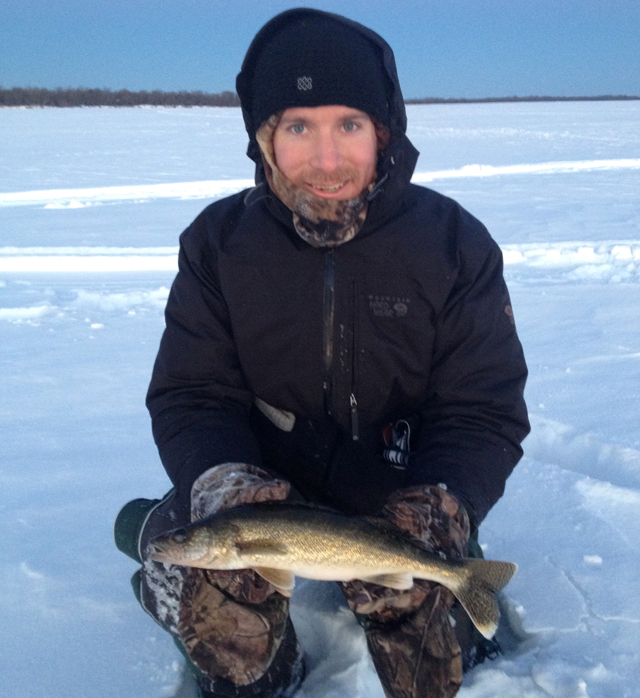 Fishing Report, March 12, 2013, Jeff Sundin - Our trip to Lake of the Woods kicked off to a modest start. We covered a lot of territory on Monday, most of it was near the Northwest Angle. Light traffic and nice weather could have combined to make this a perfect day, but the fish chose instead to make a work day out of it. Our action wasn't exactly at the peak of what the big lake can produce, but we did have a few moments of greatness. Fish are in a transition right now and it seems likely that traditional spring fishing areas will begin to fill with fish soon. But with deep snow and thick ice, the wintery conditions persist and seem to be delaying the massive spring movement that anglers are used to in march. As usual, we learned more at the end of the day, than we did throughout and we might just have a better idea of where we're heading today. There were lots of anglers who caught more fish yesterday, but we didn't know then, what we know now. Hopefully tomorrow morning I'll be bragging about these boys led me to the hot spot! My friends tell me that if you go far enough on snowmobiles, something is gonna break; And at the last minute yesterday evening, one of them did, mine. So I'm gonna have to cut this short this morning and go juggle my stuff onto a loaner sled for today's trip. With luck, today will go a little bit smoother. Fishing Report, March 11, 2013, Jeff Sundin - I know, it's only been a week, but it seems like ages since I was on the ice! Luckily, we're headed out onto the ice in just a little while and before the day is over, I'll know a lot more than than I do already. For Today, Our fishing plans are a little bit less set in stone than I thought, so tomorrows report could cover anything from Perch to Whitefish, depending on what we stumble into. One thing I know already, with an hour long sled ride to our first spot, we'll be leaving most of the crowd behind. My guess is that we'll be off of the grid, but I'll make sure that there's an update whenever I can. Oh Yes and See You !! Fishing Report, March 10, 2013, Jeff Sundin - A Snowy Adventure Lies Ahead! Here we go again, another pile of snow, this time it's the wet, heavy stuff. In fact, it's one of those mornings when you could go out and whip up a really great snowman in a hurry. That is, if you weren't too busy trying to get it all cleaned out and wrap up your chores in time to go fishing. This day is gonna fly by for me. First I'm climbing into the truck to get some of the snow plowed, then I'm packing up the ice fishing gear, the sled and a gunny sack full of clothes. After that a cameo appearance at the Grand Rapids Boat Show and then a road trip up to Lake of the Woods. With luck, I'll get there in time to snap a few photos and enough time make ready to resume our search for big Pike. From the reports I've heard so far, we're gonna need a little bit of good luck to help us along, but we'll be hustilng too. I'd really love to have a few pics to share with you before this trip is over. I already know that my connection to the internet will be sketchy at best, but if I can get the reports updated, I will. Fishing news around the boat show was a bit scarce over the weekend. Comapring notes with friends, most of them anglers from the immediate area, the stories were all about the same. Everyone wants to get back out there again, but most folks said; "I'm Waiting for the meltdown and then hope to get one more blast of ice fishing before the open water season starts". According to Bill Powell at Fred's Bait, there are some ice-fishermen on the move though. Bill said that the past three days have been busy at the store. It's a split crowd, lots of anglers heading for Winnie to bag some Perch, others heading for Lake of the Woods to take one last shot at Walleyes and Big Pike before the season ends. Bill mentioned that a lot of those anglers heading North had plans to pull their ice shelters off of the lake at the end of their trip this weekend. So far, the reports are coming in mixed, but there was one note of encouragement from my my buddy Mark Podomonick who's been on Lake of the Woods a lot this winter. Mark said if you're willing to take a long ride by snowmobile, the fish will reward you for the effort. Mark and his friends have been travelling 20 to 25 miles by snow machine before wetting a line. The long ride usually results in bagging a lot of fish though and even on what Mark called a "slow-down", his group caught a mix of about 70 Walleye and Sauger on their most recent trip. In the Grand Rapids area, everyone is asking about Crappie spots, but few if any are actaully fishing for them. Like me, frustrated by slush, they'd rather wait until travel conditions improve. Well, we'll know the answer to that question within the next 30 days, the ice will either "get good" or melt. If you think about it, either option is good news because we're only three weeks away from some great open water fishing opportunities anyhow! So the choices are improved ice fishing conditions, or the frist trip in a new boat, either way sounds like a win win proposition to me! (3/10) On Lake Winnibigoshish - A note from Pat Rooney at Denny's Resort; "We have roads open now thru Big and Little Musky (bars) north and west accross Center Bar to Ravens point. Some shoots around the Ravens area but it is getting wet. Holes drilled 50 feet off the road would help. We got about 7 inches last night." 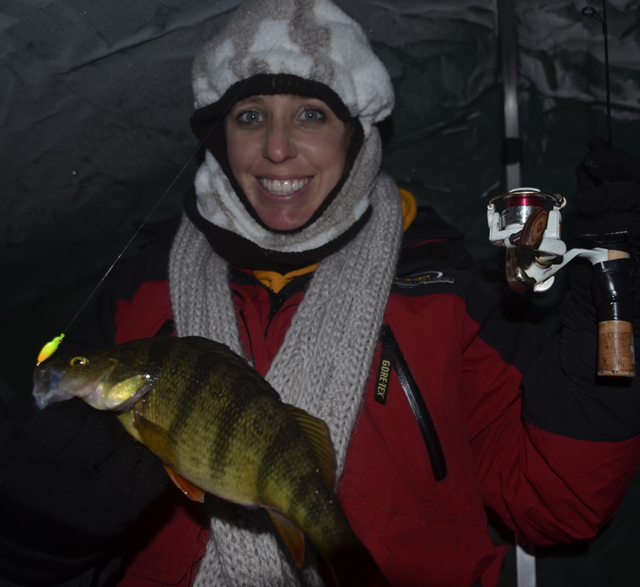 (3/10) On Cass Lake - Chad Benson has a Perch Fishing Update; "The perch fishing on the North end of Cass has been starting to show signs of picking up this past week. The nicer fish are starting to move up on the tops/edges of the bars and have been biting best in the morning and then again seem to turn on later in the afternoon. Most of the fish being kept have been in the 9-11 inch range with a few 11-13 inch Jumbos showing up as well. Fishing Report, March 9, 2013, Jeff Sundin - A Snowy Day + Great Fishing Personalities + A Great Lineup of Boats and Outboards = Great Day For A Visit! Fishing news around the boat show was a bit scarce on Friday. Comapring notes with friends, most of them anglers from the immediate area, the stories were all about the same. Everyone wants to get back out there again, but most folks said; "I'm Waiting for the meltdown and then hope to get one more blast of ice fishing before the open water season starts". At the end of the boat show on Sunday, I'm headed back up to Lake of the Woods myself, hoping for my own chance at a big Pike, maybe even a stray Walleye or two at the same time. ... back at the Grand Rapids Boat Show. It opens this morning at 10 am and runs until 7:00 PM. I'll be with Ray's Sport & Marine answering your questions about the latest Mercury and Lund lineups; Demonstrating Humminbird electronics, Lakemaster charts or just to chat with you about the up-coming fishing season. Today, the fish fry starts around 11 AM and at 1:00 PM, I'll be doing a mini-seminar about summertime Walleye and Panfish tips. There will be more seminars today too; Tom Neustrom will be there at 2:00 PM talking about Lakemaster's Contour Elite Software and the boys from "Hang Loose Outdoors" start at 3:00 PM with some advice on Walleye fishing. On Friday, it was a buying crowd and I know you're in the mood for a new rig too. This is your chance to take advantage of Lund's "Spring Catch Event" that will save you a bundle on your new boat too. So let's get together at the show this weekend. While we're at the show, keep an eye on our Fishing Reports Minnesota Page for updates that come in from visitors and friends at the show. Fishing Report, March 8, 2013, Jeff Sundin - Nikolas Dimich Teams Up With Minnesota Fishing Reports! Northern Minnesota is lucky to have someone like Nik Dimich living here. Three years into his career as a full time fishing guide serving both open water and Ice Fishing customers, Nik's great personality and energetic attitude has helped establish him as a talent to be recognized in the fishing industry. Please join me in welcoming Nik to the fishing reports pages; Not only as a contributor, but as a partner. That's right, we are teaming up, working together to serve you by expanding the fishing reports pages. Our goal is to provide, accurate, up to date, reliable fishing information in the form of professionally written, daily reports that you and your customers can count on! You'll be hearing from Nik in the coming season and when you meet him, I know you'll agree with me, he's gonna go a long way! Welcome Aboard Nik! Oh and by the way, don't take over too fast; I still gotta work another 30 years! (3/8) On Lake of the Woods, Sportman's Lodges, Jacki LaValla said; "We still have lots of ice! 30-36 inches and a pile of snow too. All land and lake trails near Baudette and the south shore of Lake of the Woods continue to be groomed and all lake access roads on the south shore continue to be plowed. Up north at the Northwest Angle, the plowed road from Young's Bay to Oak Island also continues to be plowed and probably will continue through March 17, if not longer. At this point we looking forward to ice fishing through the end of the month! We can keep our houses out overnight on Lake of the Woods until March 31. We still have some openings for March. The best bite has been in 26'-29' of water on the reefs. Jigging with a gold jig tipped with a minnow or gold/pink stop sign has been working best. Specials! Call for lodging, ice fishing packages and more! Ask about our ice fishing package specials for available dates March 17-31 with up to $40 in savings per person when you book a 2 night/2 day package or better. We are also starting to offer specials on our spring soft water lodging and fishing packages. Walleye season is open through April 14 here, re-opening May 11. 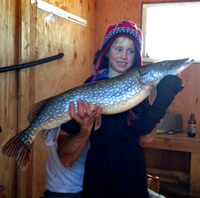 Pike season never closes and sturgeon is open catch and release through April 23. Keep one within size limits April 24-May 7 and catch and release again May 8-15. The fishing never stops here on Lake of the Woods! Lodging starts at only $39 per person per night April 1-May 23. Docking, gas, food, bar, entertainment, indoor pool, camping spots available starting May 1 and much more! Visit our website to request a reservation or for more information call 800-862-8602." - Sportman's Lodges, Lake of the Woods . (3/8) Gus Sheker, Gus' Place Resort on Ball Club Lake; "Perch fishing on Ball club Lake remains good with a solid bite through out the day light hours. You will have to sort through them, the smaller fish are usually males and they are very aggressive at this time. One trick that works is to make your bait presentation larger by using whole fathead minnows instead of minnow parts or waxies. Fish are holding at around 20 feet. There is a good 12 inches of packed snow on the lake, even more in drifted areas. Lake ice is 31 inches, up to the top of your auger. Gus' Place does have plowed lake access and a good slush-free lake road, but off road is nearly impossible without a snowmobile. Access fee is $10. 4X4 pickups with tire chains will give you better mobility on the lake, however you will still have limited travel on the lake. We will maintain the lake road as long as we can through March. Gus Sheker." - Gus' Place Resort . (3/8) On Leech Lake - At the Northeast corner, North Star Resort has a nice parking area plowed out, but there is no road on to the lake. Except for the machine that they used to plow the parking area, all of the tracks, old and new, were made by snowmobiles. At Battle Point, snow covered up any sign of traffic except for a pair of tracks hidden deep beneath the snow. It was obvious that there hasn't been anyone out there for a long time. But the parking area is open and again, snowmobilers could have that area to themselves as well. We don't know for sure about slush on Leech Lake's East side, but assume that there are some problem spots. The lack of traffic though, has been good news on other lakes and it may be similar in this scenario. In my travels, the worst areas of slush have been where fishing traffic caused the flooding. In other words, if you're the first one out there, it's likely that you can find some dry areas. We already knew that the roads going out from Pine Point and Walker are both good, so instead of driving that direction, we headed East to check out smaller lakes instead. That's where we got a little surprise; One of the smaller lakes in the area had a full, double-wide plowed road that lead out to a group of about six fishing shelters. Without any fishing gear in the truck, there wasn't any way we could check to see if the fish were biting, but it was encouraging to find a lake that had easy access. I imagine that I wouldn't like it too much if my secret road was written up in the regions most popular fishing report, so I'm gonna keep this low key. But, if you're the adventurous type, a road tour of your own might just yield similar results. Finally, a stop at Ball Club Lake where we found one last plowed access that would be good for snowmobiles. This spot was lacking plowed roads on to the lake though, so it's another dead end for vehicle traffic. (3/7) On Lake Winnibigoshish, it was confirmed yesterday that the road that was established at the Pines Resort has been closed. The folks at Tamarack Lodge plan to attempt getting the access re-opened, but it's uncertain if that effort will succeed. Access to the lake's East side is available at Highbanks Resort. On the South end, through Denny's Resort and on the West side, using the landing off of the Trappers Landing road, near McArdles Resort. Perch fishing action continues to be good, the best size fish are being taken on the West side of the lake. (3/8) From my InBox; Luke Kuchenberg asked; "I've have had plans to come up and fish Winnie for perch later next week with my dad, but not sure about access and ice conditions for getting around. Usually this time of year we get around on our 4 wheelers pretty good. Do you think we will be able to get around or should we hold off for a couple weeks yet. 8 hour drive for us to get up there, so want to have a good idea of what to expect. Thanks a lot, appreciate all you do for us fellow fishing addicts! A) Luke, Until further notice, the only ways to move around on lake Winnibigoshish are by using the plowed roads or by using a snow machine with tracks. For off-road travel, the right snowmobile will take you most places you'd want to fish, but unless your ATV has tracks, it's not going to work. That said; Perch fishermen are finding fish located near the plowed roads already, so one option would be to leave the ATV's behind and just drive out. Remember too that we could experience the late winter meltdown any day now. Without a doubt, the ice conditions are surely going to improve, so be confident that you can still make a trip up this spring. Right now, information is flowing at a snails pace, but as soon as the meltdown occurs, I'll begin hearing a lot of chatter again. So stay tuned, there's still 30 inches of ice under that snow, somewhere. Note: Access to the lake's East side is available at Highbanks Resort. On the South end, through Denny's Resort and on the West side, using the landing off of the Trappers Landing road, near McArdles Resort. (3/8) From my In Box; D.J.B wrote; "After having an awsome ice (fishing) season this year in the northeast, im looking into a flasher. I see you guys are using the humminbird ice series ... I hear the Vex is better for shallow but like the features for the money that come on the Humminbird. I was wondering how the humminbird was in the shallow weeds being thats where I'm gonna do most of my damage ,I've heard so many mixed reviews on both machines and on the marcums (too). 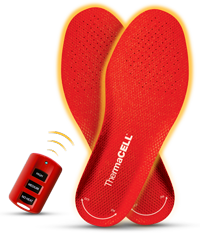 A) DJ, The discussion surrounding electronics that we use on the ice is changing every season. For me, the Humminbird flashers have been very reliable and each of their units Ice-35, 45 and 55 have much larger screens than the Vex. I've enjoyed that single feature the most, because all by itself, it allows me to see a target better than I can on a smaller size screen. During the 2012 season, I used a couple of different units, one of the was an Ice-45 which was probably the sweetest individual flasher that I've ever used, but it didn't belong to me and I had to let the owner drag it bag out of my hands at the end of the day. Since then, I've used several other models, but the direction I'm heading for next season is the 597. You could say that it's the perfect system. It combines a high quality sonar, with a fantastic GPS/Charting system and when you add Lakemaster's charting tools, you can pinpoint most of the fishable structure before you ever arrive at the lake. For your shallow water applications, you'll like the fact that Humminbirds units allow you to set both a minimum and maximum depth. You can literally select any zone in ther water column, zero in or out until you're confident that you've got every inch of the most productive territory displayed on your screen. Go ahead, get a second opinion, but before you jump on anything, look at the 597. In fact, let me know where you're located and I'll bet that there's someone in the in the neighborhood who'd give you a reliable demo. Fishing Report, March 7, 2013, Jeff Sundin - March snow storms are incredible! One day blizzard conditions have you pinned down in the plow truck and the next, it's like a day at the beach. On Wednesday, Blue skies and sunshine were already beginning to erase snow from some of the roof tops and dark spots on the roads, really soon, it's all gonna be gone. Yesterday, I spent a few hours on an afternoon "road tour" checking lake access conditions with my friend Nik Dimich. Neither of us had heard a word about the East side of Leech Lake lately, so we decided to just drive over there and look for ourselves. We found a lot of wide open space and if you have the right gear, you could go over there and almost have the whole lake to yourself. At the Northeast corner, North Star Resort has a nice parking area plowed out, but there is no road on to the lake. Except for the machine that they used to plow the parking area, all of the tracks, old and new, were made by snowmobiles. 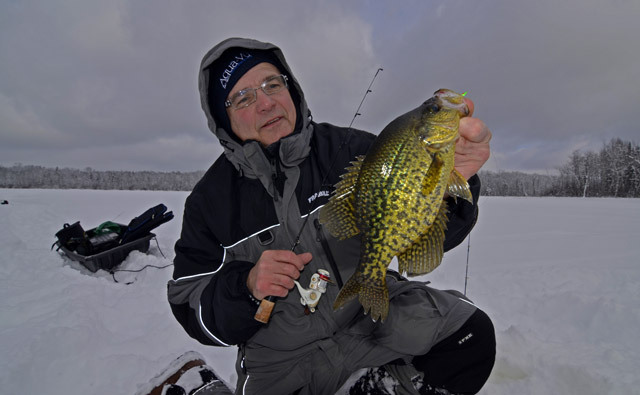 (3/7) From the Lake Winnie Region, Nik Dimich says; "Crappie fishing around Winnie and on connected Cut-foot Sioux has been tougher, especially for bigger crappies. There are, however, some nice biting fish and the opportunity for nicer ones is always present. Crappies are holding around steep drops and deep holes. I’ve been having luck fishing with small bug type lures from Northland and Lindy tipped with wax worms. On other Grand Rapids area lakes crappies have been fallowing the same pattern of “deep hole” fishing and are closer to the rims at structures 20’. Blue gills have also been on these slopes and in a bit shallower roaming the" ...>> Read Nik's Full Lake Winnie Region Fishing Report here. (3/7) According to Zach Dagel, Grand Rapids Guide Service; Perch fishing on Lake Winnie's West side was good over the weekend. Zach's group had good size fish and were able to keep a 50 fish bag on each day of the trip. Zach reported that their best action was coming from Center Bar and Sugar Bar. Fishing in 14 to 16 feet of water and using jigging spoons was the best presentation. >> Read Complete Grand Rapids Report . (3/7) Marcell Area Lakes - There's an understandable note of frustration in the report from Paul Larson, Frontier Sports; "Enough with the snow already! The conditions on the area lakes area are marginal at best. Plenty of ice but slush is being reported everywhere. Very few folks went out last weekend and the recent storm just makes getting out on the ice that much more difficult. Just a reminder that shelters must be off the ice no later than midnight March 18th. With conditions as they are it’s gonna be a bear to get them off now. Our Annual Winter Ice Fishing Clearance Sale is on now thru April 15th. All ice combos, Vexilar and Humminbird flashers, Fish houses, Augers and more are on sale. We’re making room for all the new spring and summer tackle that’s arriving daily. Many new items from LIVE TARGET, Rapala, Shimano and more. Drop by or call to find out what’s new and be sure to check us out on Facebook." - Paul Larson, Frontier Sports, Marcell, MN. 218-832-3901. Fishing Report, March 6, 2013, Jeff Sundin - In the Deer River area, the snow ended sometime during the evening on Tuesday. The wee hours of the night were filled with clear skies and starlight, but transformed back to Grey at dawn, temporarily. According to the radar screen, we've got a day filled with sunshine headed our way. It won't be a surprise that fishing traffic in the area was extremely light on Tuesday. Bill Powell at Fred's Bait told me that he had one group in the morning and one more later in the afternoon. A slow day at the office and a story that was repeated by Paul Larson at Frontier Sports in Marcell. At the moment, we know that the big operators on Lake Winnie and on Leech Lake have been able to keep their plowed roads open. But, some of the smaller operations have already closed their roads instead of trying to fight the slush to keep them open. Cass Lake conditions are sketchy, but I spoke with one angler who's fishing reservations had been cancelled by the resort operator who called and reported that he was unable to get the road(s) open and place the fish houses on the lake. There may be other operators who have had better luck, but I'd suggest not heading anywhere without first calling. Lake of the Woods and Rainy Lake have good road systems and will remain accesible until the meltdown finally takes hold. 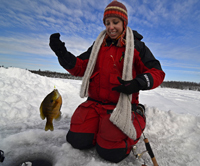 Locally, Perch fishing is what most groups are doing and the action has been the most reliable on the West side of Lake Wnnibigoshish. Today, the conditions will begin to improve and a little bit of information will flow. But it feels like if I want to get a great handle on conditions, I see a road trip coming in the next day or two. From my In Box (3/6) ; Q) I do have a question for you. I have been ice fishing on a lake north of DL, this has happened twice to me, the crappies start biting at dusk and the bite lasts about an hour and then they stop, but then i begin marking fish from the bottom up about 6 ft. i am fishing in about 13 ft of water. i mean there are alot of fish and some are big, but I can't get them to bite, using either minnows or wax worms. Is there a hatch coming from the bottom and they are only interested in that or what? I don't own a camera, and really wouldn't want one, but it would be awesome to see what is going on down there. What do you make of it? have you experienced this before? Jim S.
A) It's not a hatch persay; But it is solid wall of aquatic life. These microscopic organisms become active during low light and they are what generates all of the noise on the dial of your flasher. There are forms of living plankton in the lake that we seldom pay attention to, but are important to the health of the system. They provide food for tiny fish and other critters living in our lakes. You are viewing these microscopic creatures as they become active during low light periods. You could loosely compare it to a school of fish going out for their "evening feeding" run, but that's an over-simplification. like the larger fish do and short of turning off your electronics, there's not much you can do about it except enjoy to the show. In my younger days, we would wait out the fish during this period and after about an hour, maybe longer, the Crappies would begin to bite again. Some of our best Crappie action occurred during that second feeding run. Depending on the lake you fish, it's possible that you could duplicate that result by toughing it out until well past dark. - Good Luck Out There! (3/6) From the Lake Winnie Region; “March more and more reminds me of fall because it is a quick transition. There are lots of things to do in a short window of opportunity. March offers traveling anglers many options and enough sports to tune into while on the road, with the Minnesota High School State Hockey Tournament, the last WCHAA Final Five and, of course, the NCAA Final Four Basketball and Hockey tournaments. March also offers the last weeks of good ice fishing for “jumbo” perch on and around Lake Winnie area, on Lake of the Woods for its monstrous spawning northern pike, the Brule’s Steelhead Trout run and by month’s end the melting snow thawing ice gives way to great walleye action on the Rainy River. For me there is a lot do in March. There is still plenty of good ice fishing to be done on Lake Winnie, Ball Club and Bowstring to name a few classic spring fishing lakes. Going into the last couple weeks of ice fishing is always exciting. The days get longer and fishing seems to get better as well. It’s just nice to be outside standing on the ice sheet with a warm sun beating down. March snowstorms, like this last one, still seem to set things back for a few days. We’ll see how the latest snow affects us. But as far as fishing goes, the fish just don’t seem to mind all this “extra” activity going on this month. Perch fishing on the big pond of Lake Winnie and surrounding lakes of Ball Club, Bowstring and Pokegama seems to differ as each lake varies vastly in structure and depth. When the spring perch transition takes place, the migration begins on shallow water lakes earlier. The perch on Winnie head into shallower water structures and flats and will continue to cruise these flats chasing minnows and moving forage. On Winnie the ideal depths are usually in the 8-12’ and sliding out to 17’ depth. If you can find soft spots on these flats they will usually hold more forage producing more fish. Be sure to be mobile when fishing shallow water perch to keep up with active fish. Drill several holes in an area and fish these holes until you find some keeper fish; make sure, however, you are ready to move if they don’t. If they do bite and then quit, wait a bit to see if they come back. Spring bites come in spurts and then slow down until the next school comes through. On deeper lakes like Ball Club and Pokegama perch over the last week have been holding in soft spots off steep structure and I am starting to see nicer perch closer to break line structure of 20’ and on top or near the slope of the drop. When searching for structure, look for inside turns on break lines and start fishing on top of the structure. Then drill a line of holes leading into deeper water and fish a variety of depths. I still have been having most luck using Lindy Rattl’N Flyers, Northland Buckshot and Forge Minnows in the 1/16 – 1/8 once tipped with a minnow head. If an opportunity to fish two rods is present or you would like to fish a “dead stick” technique, I like to use a drop line or drop chain with a single hook tipped with a fathead chub dropped below a forge minnow or spoon. This is a great way to attract “bigger” perch. Crappie fishing around Winnie and on connected Cut-foot Sioux has been tougher, especially for bigger crappies. There are, however, some nice biting fish and the opportunity for nicer ones is always present. Crappies are holding around steep drops and deep holes. I’ve been having luck fishing with small bug type lures from Northland and Lindy tipped with wax worms. On other Grand Rapids area lakes crappies have been fallowing the same pattern of “deep hole” fishing and are closer to the rims at structures 20’. Blue gills have also been on these slopes and in a bit shallower roaming the deeper weed lines in 10-14’. With changing ice conditions, mobility is always a concern. Snowmobiles will still be the way to go over the next week and remember to try to travel with others, just not to closely or you may be stuck in the same slush hole as your buddy. Also try and avoid heavily fished areas, as these will be holding more water under the snowcap. Using resort- plowed access is still the best way on and safest way off the ice. Fishing Report, March 5, 2013, Jeff Sundin - March Madness, Nothing To Get Mad About. Okay ice anglers, don't be upset. It's just another little snowstorm and luckily, it's coming at the perfect time. We all enjoyed a great weekend before the snow arrived and now, we have another good weekend to look forward to after it passes. Happily, everyone is tucked away safe and sound, already knowing that the worst of what winter could dish out, is already behind us. Spring is just around the corner! In fact, just to put things into perspective; My first scheduled open water fishing trip is in only 30 days. Depending on conditions, it could come even sooner. If I was counting, I'd also tell you that the Minnesota Walleye Fishing opener is now only 67 days away and that the fall colors will set in only ..... wait, I better not get too carried away, that'll come fast enough! :)!! Right now, there's not too much point in talking about fishing, at least until we see how much snow we actually have once this storm finally blows through. (3/5) On Bowstring Lake, An update from Erin at Geiger's Trails End Resort; With the storm's arrival, Bill and Erin are concerned about keeping up with the plowing. They're doing their best to keep up, but Erin asks that you please call ahead before driving out. They'd be really disappointed if they have to turn anyone away, but at this point in the season, finding ways to keep the snow under control is problematic. Before the storm arrived, fishing became a little bit unpredictable. Erin said; "There's apparently no rhyme or reason as to when the fish were biting. We have a weather station that shows barometric pressure, wind speed, 5 day history, and temp. Watching the barometer, it was up and down, but did not correlate with when the fish were biting. We tried to make sense of it, but the truth is, the fish are down there and are biting when they want. One say the perch bit during early morning and 2pm. The next day they only bit from 2-4pm. As for the crappies, the spot where they are always biting, was full of houses and people trying everything possible to get them to bite…then along comes a group that dropped a bare hook and were reeling them in one after the other." - Erin and Bill Charlton, Trails End Resort . (3/5) On The Iron Range, From Greg Clusiau; A fishing trip that lots of folks have heard about, but few have experienced. Clusiau spent part of the weekend ice fishing for rainbow trout on the Red Lake Reservation and on this day, the Trout were more than cooperative. There are four trout lakes available for winter guide trips during the winter. Each lake contains different species and has trophy-class fish swimming within it's waters. Clusiau says; "I mean BIG. Heck, the lake trout average 8-14 pounds! " ... >> Read Greg's Full Report . 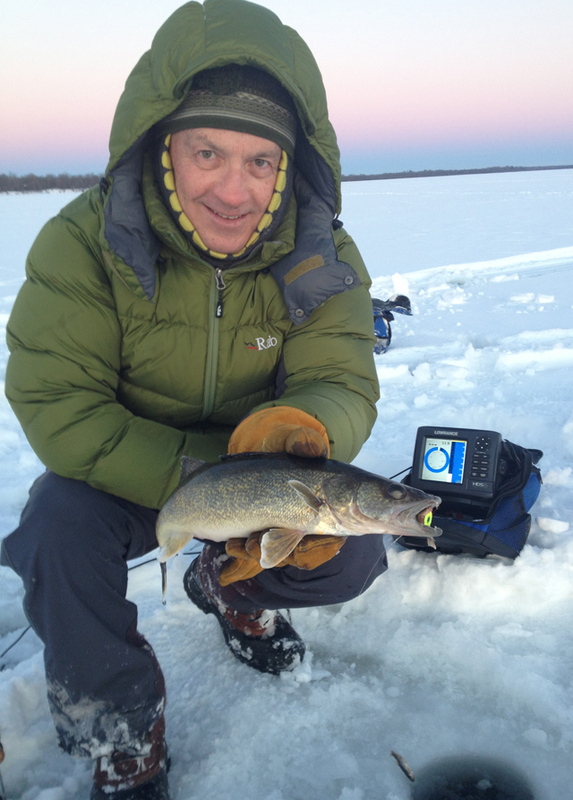 (3/5) Bemidji Lakes Area, Paul A. Nelson, Bemidji Area Lakes Guide Service says; "March is one of the best months of the winter for ice fishing. Unfortunately, March is also one of the snowiest months of the winter, which has been a problem for lakes in the Bemidji area. The plentiful snow is great for those who have been using the snowmobile trails, but the lakes have more snow than they need, which is creating slush problems on most of the lakes. Anglers are using every inch of their augers to get through the ice and snow on the lakes. Anglers may have noticed they are drilling through more than one layer of ice as they drill their holes. There is also a large amount of water mixed in with the snow and ice on the lakes. 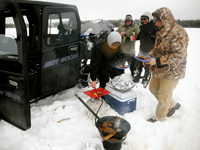 Anglers with snowmobiles rigged for ice fishing are at a distinct advantage when accessing the lakes. Anglers trying to fish out of their vehicles are limited to wherever they can get on the roads, with the structures close to the roads getting most of the fishing pressure. Fish operate on their own biological clocks, so they are preparing for spring even though the lakes are still covered with heavy snow and ice. The weather conditions can slow down the progress towards spring, but they can’t stop it. Fish key on several factors including the increasing amount of daylight, so they continue to position themselves for spring, even though the lakes still look like it is mid-winter. (3/4) On Lake of the Woods, Border View Lodge, Mike Kinsella wrote; "We have been moving again. We have had good success in some places, although it has been sporadic. Our ho uses are in 4 different locations across the lake. We have houses off of Pine Island in 26 feet of water and 31 feet of water. We are also covering different depths around two separate reef areas. Catch rates have been about the same in all areas. On any given day, one place can be a little better then another. Having a constant eye on the sonar and using small presentations has been producing. Quick actions and rapid jigging seems to chase the fish away while small and subtle action seems to trigger more bites. The forecast looks great to keep us out fishing in March lows into single digits and highs up to 30’s for the week ahead. We still have plenty of snow cover that is keeping the ice in great shape. Don’t forget we are able to have our houses out until March 31st and Walleye is open until April 14th." 1-800-776-3474 Border View Lodge . 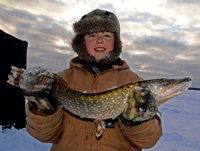 Fishing Report, March 4, 2013, Jeff Sundin - Rainy Lake Delivers, Even If Northern Pike Won't. It's not too often that I go fishing, get almost completely snubbed by the fish and still come home happy. But if there's any place that can make me feel that way way, it's Rainy Lake. If you're not reeling in a fish; Then a sunny afternoon, under a clear Blue sky, surrounded by gorgeous scenery isn't a bad option. We arrived in International Falls on Thursday afternoon with high hopes that our timing would be good for capturing a couple of giant Pike. We knew going in, that problems with deep snow and slush have really been hampering mobility on the giant lake and that we didn't have a lot of options. But we were ready to give it our best effort and our spirits were good. Comparing notes with International Falls, fishing guide, Chris Granrud, we came up with a workable plan. First we'd drive out to the end of the National Park's public road, then take a short trip on snowmobiles to an area that Chris had confidence in. On Friday morning, it wasn't long after we arrived, that it looked like Chris was right. Within a half hour, one of the flags went up and the line started zipping off of the spool. But when Chris set the hook, the Pike snapped the line, and swam away leaving nothing behind except for a disappointed look and a few questions. That's okay, so we missed our first chance at Mr. Big, it's no biggy; Unless it's the only bite you get all morning. Yup, that was it, the only bite and after a few hours, it was obvious that we'd arrived at this spot before the Pike had; So we broke camp and a hungry crew grabbed a quick lunch while Chris and his sidekick Mike (sorry Mike, I never got your last name) set up in new territory for the afternoon. During the afternoon, there were moments of high optimism. Flags went up several times and there were a couple of strikes on the quick set rigs that we'd strung on heavier action spinning rods too. Still, none of those fish seemed too large and none of them wound up on the ice either. A gorgeous afternoon, great company, beautiful scenery, but no trophy. Three out of four was still pretty darn good! On Saturday, a different strategy; Fishing on a large mud flat where Chris had some action on recent trips. Set up over 35 feet of water, we had a few tip-ups set and several spinning rods. 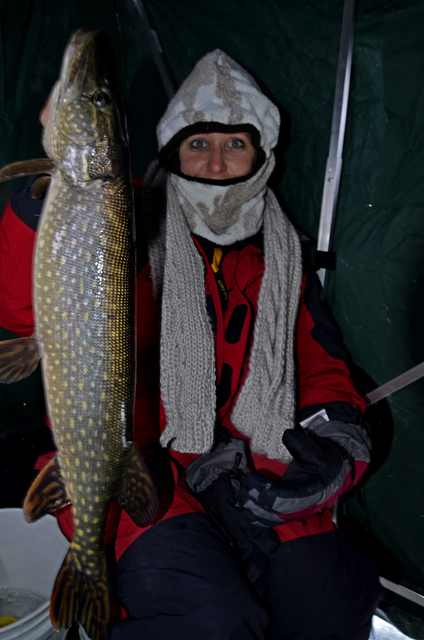 We still really wanted the Pike, but a Walleye or two might help keep us in the game too. We could see fish on our flashers, but getting them to strike in the morning was nearly impossible. So at lunch time, a day and a half into the trip, we had iced only a single scrawny Perch. This time, the crew headed in for lunch while I stayed out and tried to set up my own "plan B" for the afternoon. Oh, don't worry, I got fed too. In fact, I got special treatment, a meal that was hand delivered! My plan was to get set up on top of a nearby reef that topped out at 16 feet. Maybe, just before dark a couple of us could high tail it over there and try to capture some fish during a late afternoon feeding run. We never got back there though because, over on the mud flat, a small but welcome flurry of action came our way during the last couple of hours. First a Pike, not big, but still good enough to get us giggling. Then a nice Walleye, followed by just enough "eaters" to give us the idea for a fish fry. Scrounging up the ingredients for a fish fry wasn't too hard and somehow, a slow fishing trip was transformed into a great fish fry in just a couple of hours. Okay, so we got there ahead of schedule for the fish, nobody has perfect timing. But we had a great trip anyway and like always, Rainy Lake worked it's magic. The trip back home was full of smiles and cameras full of images more beautiful than I can describe. The fish? Oh yeah, we'll get 'em next time. (3/4) On Bowstring Lake, Erin at Geiger's Trails End Resort; Are having a frenzy of people coming through their access. They still have a road that will get you to where the Crappies are, out on the big flat. Unfortunately, their road out to Rock Clusters has drifted closed, but Bill is working hard to get a new road open. The reasonable $10.00 access fee is helping offset the expense of keeping the roads open and for anglers who want to fish Bowstring, it's the best way to gain access. The Crappie action had slowed for a few weeks, but Erin says that they are starting to pick up again. Her tip for getting them to bite is to be patient. The fish are hitting best just before sundown and might be finicky, but experimenting with presentations will eventually lead you to a winning combination. Erin ended with a little teaser; "We have a new spot and ALL the Perch you can get. Come see us and we will direct you. Call before coming if you are looking for a specific spot. Don’t forget about our Pizza’s for sale…we will make them and deliver out on the ice! See you on the ice! Erin and Bill Charlton, Trails End Resort . On all but a handful of area lakes, snowmobiles are the only game in town for the next few days. Anglers without snow machines can visit resorts that provide plowed access roads. Perch and some Walleyes were showing up on our flashers constantly. Smaller Perch were fairly easy to catch, but nice ones were few and far between. Ice fishing on Winnie for Walleyes on Saturday was short, but sweet. The fish appeared right on time appearing just as the sun touched the horizon. Jigging with Rattln' Flyers and minnows, the action lasted for about 45 minutes on a shallow rock reef.The names have been changed to protect the innocent! 10 year old Kevin Boyer, a kid who goes outside and does stuff. He's showing off the result of sticking with the project until it finally pays off. Walleye action was limited to a 45 minute flurry of action just at sunset. This one struck a Rattln' Flyer Spoon, tipped with a minnow head. Depth, 12 feet of water, just off the edge of a shallow rock pile. 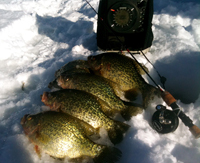 Courtesy Nik Dimich: Crappies are catchable where you can find them. Deep snow and moving fish are forcing anglers to leave the trucks on shore and pull out "The Toys". Running and Gunning in deep snow won't be a problem for area guide, Nik Dimich. His Polaris Ranger ‘Limited Edition’ Crew 800 is what he calls a “dream” ride and has room for up to five fishermen, while pulling two Frabill portable fish houses, Wide Open Company (WOC), Grand Rapids, MN helps keep his clients out of the elements! Courtesy Matt Breuer: "Last spot of the day we found fish 4-6' under the ice over 14-21' of water on a steep break. Literally fished right under the 'ducer on the FL-22HD... very fun and surprising this early in the season!" Lindy's Ice Jig, Glow/Blue color tipped with a tiny artificial tail isn't far behind. Try mixing and matching soft plastic tails until you hit your favorite combination. Courtesy Sportsman's Lodge: Big Pike are beginning to show up on Lake of the Woods. Just ask young Peter, six years old is not too early to start catching 'em either! I know, it doesn't have a darn thing to do with fishing, but You Know how I am about those girls of mine! So just for this moment, brag, brag, brag .....:)!! Courtesy Spenser Samplawski: Got an early down payment on the jumbo Perch season! This jumbo and many others were on the prowl and eating Rattln' Flyers. Spencer said "On frigid nights like this, the anticipation of March air sounds charming!" Courtesy Nik Dimich: "These fish were easy to locate on the Humminbird as they were suspended in 25-30 FOW and bit on small jigs tipped with wax worms and spikes". Courtesy Matt Mattson: Upper Red Lake Walleyes are where you find 'em. Reports are mixed, but anglers seeking creative solutions are finding fish to catch. Chris Renne teamed up with Matt Mattson and found some. The #2 Frostee Jigging Spoon tricked this "slot-fish" into the house for a quick photo. 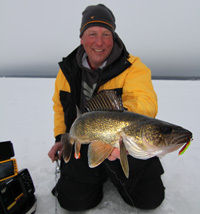 Contrary to popular opinion, Lake Mille Lacs still has keeper size Walleye and Jon Thelen can show you how to catch 'em. At Bowstring Lake, pressure ridges are cropping up at the landings. Travel by vehicle is still possible, but exercise caution. The #4 Frostee, Firetiger color just keeps on catching fish. This one, tipped with a Waxworm and fished about three feet above bottom has been deadly this week. You can take the girl away from the Bass Circuit, but you can't take the Bass away from the girl. 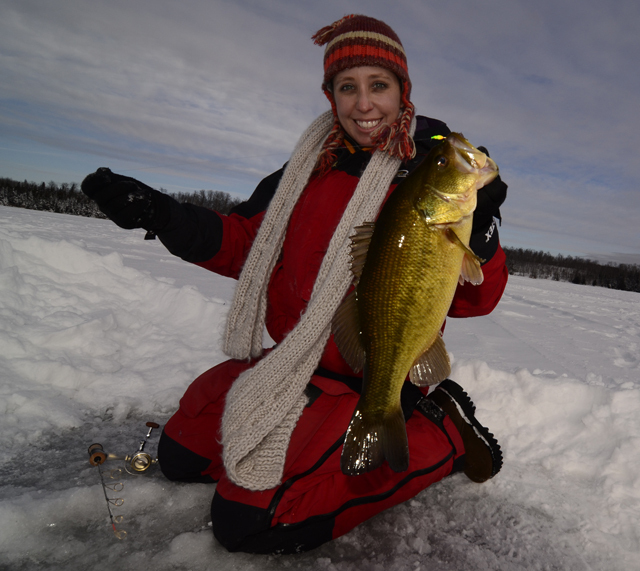 Forwarned that she'd never see one on an ice fishing trip to Minnesota, Melinda Hays shrugs off warnings and bags two of them! Lindy's #4 Frostee, Firetiger color was a deadly weapon in the hands of Melinda Hays. Located over a soft bottom in about 13 feet of water, small packs of sunfish moved in and out of the area. The larger, flashier Frostee helped attract new fish into the area. Bluegill action picked up during late afternoon as clouds rolled in and thre sun dropped low in the sky. Ice Whatsits produced fish and so did Frostees tipped with Waxworms. Melinda Hays shows off one of a dozen or more Pike that kept the action going between spurts of Perch. Round Lake's special regulations on Pike appear to be working. All of the pike we caught were "above average" and some were downright nice ones! Lindy's #4 Frostee accounted for the lions share of Perch. Tipped with a small, dorsal hooked Golden Shiner, the fish had a hard time resisting. Mike Pehanic, Purveyor of Mike Pehanich's Small Waters Fishing. He's off showing the reward for hoofing it back into the timber. Ten inches of fresh snow encouraged a good daytime panish bite on this, the quintessential, small water experience. Oh yeah, I got in on the act a little bit too. She always wanted to be in show business, but this one got a little more than she bargained for. Please be careful with your Rattln Flyers, if you get them too close to a fish, they'll eat it!